This is the 4th Tutorial in our Micro Focus Quality Center Training series. You can check all the previously published tutorials on this page. Note – As the tutorial length is little long we have divided our initial 4 days training into 6 tutorials. This will help you to learn Micro Focus Quality Center step by step with every minute detail. We are working our way through ALM and have discussed Release, Cycle and Requirements. In our previous session we created a release, added cycles to them, created requirements, mapped them back to cycles and releases and finally, we saw how the statistics are affected based on these mappings. In our article today, we will move on to the further steps. We will keep referring to the same Gmail.com example that we did in the previous articles. If you are not familiar with the same, please refer to the below article that came out before this one. c) Launch Gmail, enter an incorrect username, incorrect password and click Login. Let us see how to create the same test case in ALM. 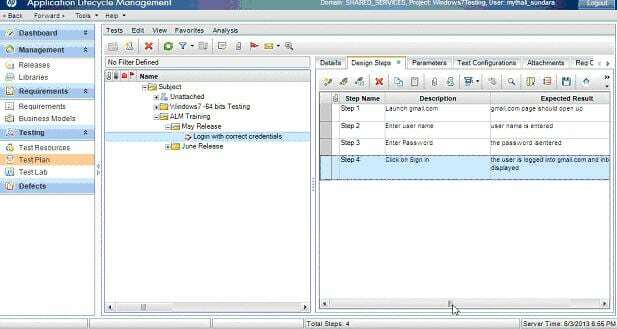 Step #1: Login to ALM into the right project. Create the release, cycles and requirements as described in the previous tutorials. Step #2: Go to the Test Plan tab by choosing “Testing->Test Plan” from the sidebar. Step #3: Choose “Subject” as your home folder and create a subfolder “ALM training” under it. I am going to create “May Release” and “June Release” Subfolders under it. Step #4: Go to May Release folder and choose the option to create a new test. Step #5: Enter the name and then choose the “type”. Choose “manual” for our tutorial. Step #6: Enter the other details. The designer name will be auto-populated based on your login credentials. Click OK. The test gets added. Step #7: Now you can add your steps. Click on the “Design Steps” tab. Click on “New Step” icon. Step #8: Enter the step details. The description and Expected Results fields come up complete text editing features that are self-explanatory. This completes the process of adding test cases and steps to them. Step #10: Under May release I am going to add some more test cases. 2) The requirements tree gets displayed on the side. Expand the tree and select the needed requirements. 3) Once done, close the requirement tree. You can link a test case to as many requirements as you would like. This is how the added requirement looks. You see how the test details and it’s the test’s status is displayed. Since this test was just created and never run, the coverage status shows as “No Run”. Let us now move on in our tutorial and learn how to run a test. Imagine we have just begun the May release testing phase. The first cycle is Smoke test. We are not going to execute all the test cases we have. Briefly, a smoke test is a high-level test performed by the QA team on an AUT as soon as the code is deployed to make sure the application did not break. So we are only going to execute test cases 1-a and 2-c.
Test lab tab will help us create test sets that contain the test cases that we need to execute in each phase. This is where the tester can execute the tests and record the test results. Let’s see how. Step #3: Enter the test set name. Click OK. Step #6: Alternately if you choose the “Requirements Tree” tab, you can choose requirement and all the tests that are linked to it get added to your test set. Step #7: Go ahead and create all the test sets. As you can see from the above screenshot I have created a test set each for each cycle. Step #8: Tip: You can choose to add the same test multiple times in a test case. In that case, the second instance of the test will appear with a prefix . 1) If you observe, we have created our releases, requirements, tests etc all under the parent folder “ALM training”. There is no rule that you should do that. You can choose a different name for your folder in each section. But as you have seen, it makes so much sense to use the same folder name. For a real-time project that you are working on and trying to use ALM for, try to come up with a name that you would want to consistently use across as the first step in your test management process. 2) The columns in the test plan tab or any other tabs can be customized by your project’s ALM admin. This finishes how we create tests, add steps to the tests, link the tests to requirements, create test sets, adding tests to test sets, and finally backtracking our way to see how each activity affects the statistics each time. In our next Quality Center tutorial, we will learn how to execute test cases and check execution status using this tool. Please let us know how we are doing. We value your opinion and will take all feedback very seriously. Who know hoe to change the text case direction writing to right to left?